Season the venison with salt and pepper. Heat a splash of olive oil in a frying pan until hot. Place the venison in the pan and brown for 30 seconds on each side, making sure that the meat remains raw inside. Remove from the pan and place in the fridge to chill. Roll out the pastry on a floured surface to the size of an A4 piece of paper and about 1/2cm thick. Place in the fridge to rest. Make the pancakes. Crack the egg into a bowl, whisk in the flour until smooth, then pour in the milk and whisk to a light batter consistency. Cook 4 pancakes in a non-stick frying pan, using a small amount of vegetable oil. Transfer to a wire rack. Cut the cauliflower lengthways through the centre into 4 slices, leaving the main stalk on. Lightly whisk the egg in a bowl to make an egg wash for the pastry. 1 Lay the pastry on a floured surface and cover with the pancakes. Place the cooled venison in the centre. 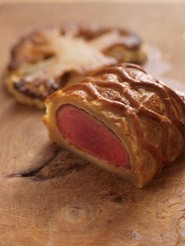 2 Brush the edges of the pastry with egg wash, then roll the pastry around the venison so that it covers it completely. Fold a small amount of the pastry ends underneath, trimming off the excess first. 3 Turn the Wellington over so that it is seam side down and brush the top with egg wash. If you like, you can now gently score the pastry and use any trimmings to make a lattice finish. Egg wash the top again, then place the Wellington in the fridge for at least 30 minutes (or up to 24 hours). 4 Meanwhile, preheat the oven to 220°C/200°C fan/ gas 7. Brush a large, heavy baking sheet with oil. 5 Place the Wellington on the baking sheet and bake for 25 minutes, using a probe or thermometer to make sure the centre of the meat has reached 37°C (perfect medium rare). 6 Meanwhile, heat a splash of olive oil in a large frying pan and place the cauliflower down flat in the pan. Season generously with salt to prevent the cauliflower from burning (salt draws out the moisture and allows the sugars to caramelize slowly rather than brown), then cook over a medium heat for 5 minutes on one side. Turn off the heat, and place a small plate or tray on top of the cauliflower. Leave for 10 minutes so the cauliflower will sweat and draw up the colour from the pan. 7 Remove the Wellington from the oven and serve immediately, with the cauliflower on the side. Red Wine Sauce is a great accompaniment to this dish. For a touch of sophistication, serve with croûtes topped with spoonfuls of Chicken Liver and Foie Gras Parfait. The richness of the parfait with the caramelized cauliflower and gamey venison is a great combination.